May 16, 2018, in Tashkent, the international scientific and practical conference of Russian philologists "XIV Vinogradov Readings" was held. This event, which has already become traditional, is one of the most outstanding events to promote the Russian language in Central Asia. 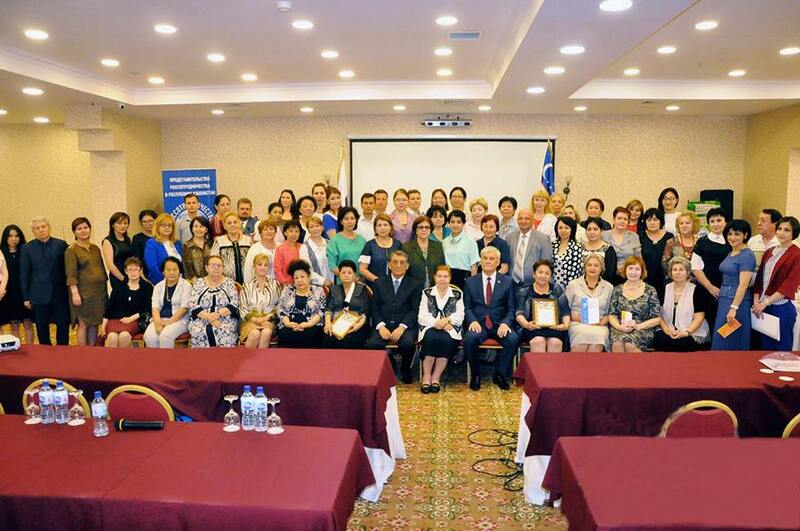 Among its permanent organizers, there are the Tashkent Association of Teachers of Russian Language and Literature (Russian abbreviation TOPRYAL) and Rossotrudnichestvo Representative Office in the Republic of Uzbekistan. USUE participates in this annual philological forum for the second time. This year's event was attended by Vadim Mitrofanov, the adviser-envoy of the Embassy of the Russian Federation in the Republic of Uzbekistan, Viktor Shulika, the head of the Rossotrudnichestvo Representative Office in Uzbekistan, Ganisher Rakhimov, rector of Uzbek World Languages State University, Nasirullah Mirkurbanov, professor of the Department of Russian and Foreign Literature at TSPU named after Nizami, B. Gorodovikova, the head of the department at Kalmyk State University, professor Tamara Esenova, members of the Union of Writers of the Republic of Uzbekistan, teachers of universities, and journalists. Natalia Petrukhina, the chairperson of the Tashkent Association of Teachers of Russian Language and Literature, expressed her gratitude to the USUE rector Yakov Silin for the support of XIV Vinogradov Readings. 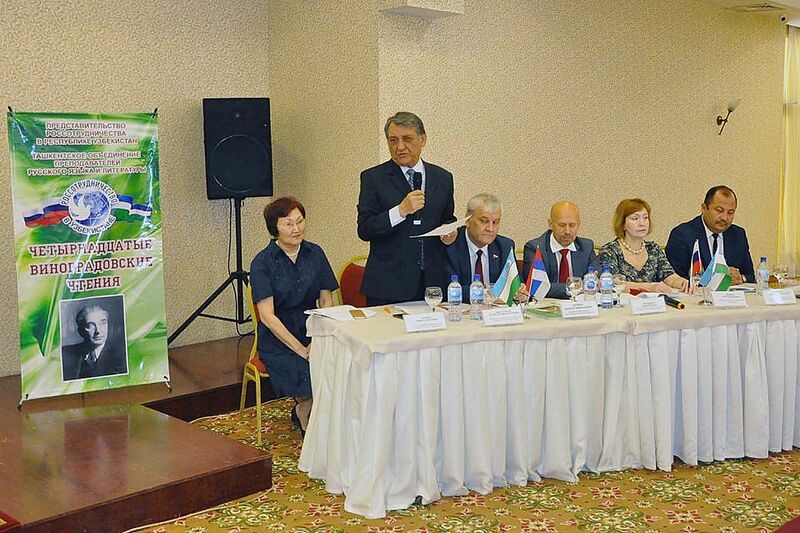 The rector of Uzbek State World Languages University Ganisher Rakhimov expressed his readiness for cooperation with USUE and other universities of the Russian Federation. USUE was represented at the forum by the chair of the Department of Business Foreign Language, Dr. Elena Makarova. During the plenary and break-out sessions, the participants exchanged experience in training. In the speeches of the conference guests and participants, the role and significance of the Russian language in strengthening multilateral cooperation between the Russian Federation and the Republic of Uzbekistan were repeatedly stressed. Elena Makarova made a report "The Role of the Russian Language in Multicultural Communication" and presented the results of her study devoted to the analysis of the functional yield of the Russian language among students from the Republic of Uzbekistan, as well as the study of the intensive use of other languages in multicultural communication within Russian university environment. The report aroused great interest among the conference participants. 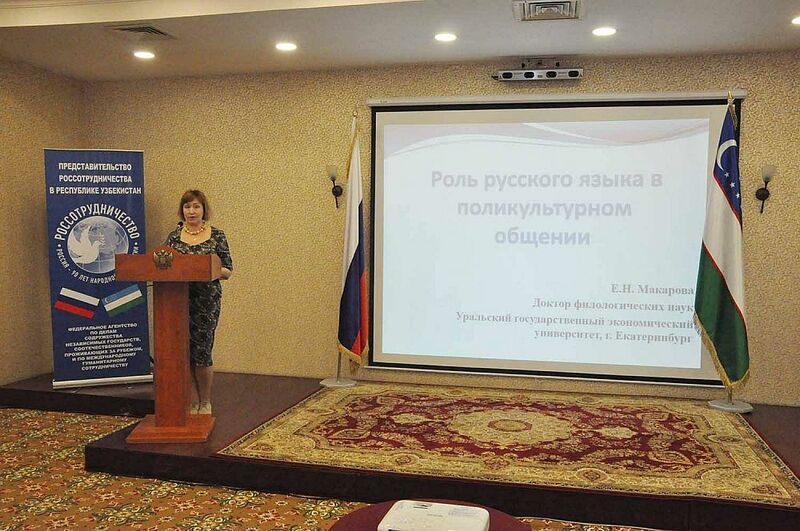 On May 17, Elena Makarova delivered lectures at Uzbek State World Languages University to teachers of Uzbek universities who had come there to take advanced training courses. May 18, some meetings were held with philologists from the Samarkand State University where current trends in the development of modern linguistics were discussed, and ways for developing cooperation were outlined.